With a fork prick the mango in multiple places and boil in water until the skin has softened and the flesh is soft. Deskin and remove the flesh or squeeze out the pulp. 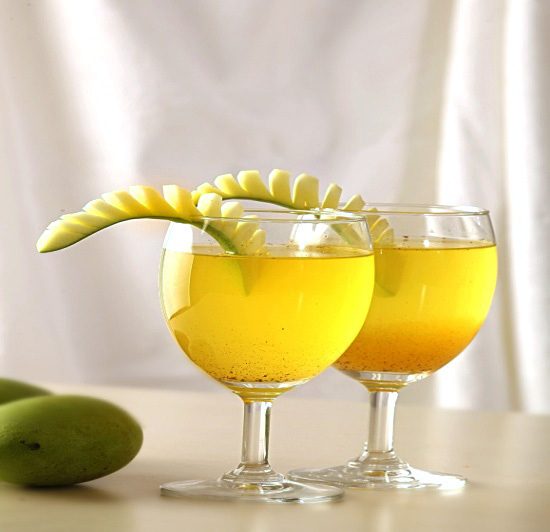 Add water to the pulp (for every 20 g of mango add approximately 40 mL water). Strain the mango pulp using a strainer. Depending on taste, add sugar and water to dilute the juice further. Add the salt, cardamom and saffron powder to give the drink a savoury twist.